Consumers with solar installations can generate solar energy in excess of their current need at certain times of day and can feed it to the grid. At other times, especially at night they need to draw from the grid. There are different ways a solar home can be connected with respect to the grid. In this case the solar panel output is converted to AC by the inverter, and drives the load-as much of it as the panels can provide under the sun conditions. Excess available power from the sun is not utilized. If a battery back-up is provided the DC power from the panels charges the battery. The inverter draws from the battery and feeds the load. There is no connection to the grid-inwards or outwards. The solar panel feeds the inverter which is connected both to the grid and the local load. When solar power is in excess of the local demand, inverter feeds the excess power to the grid. 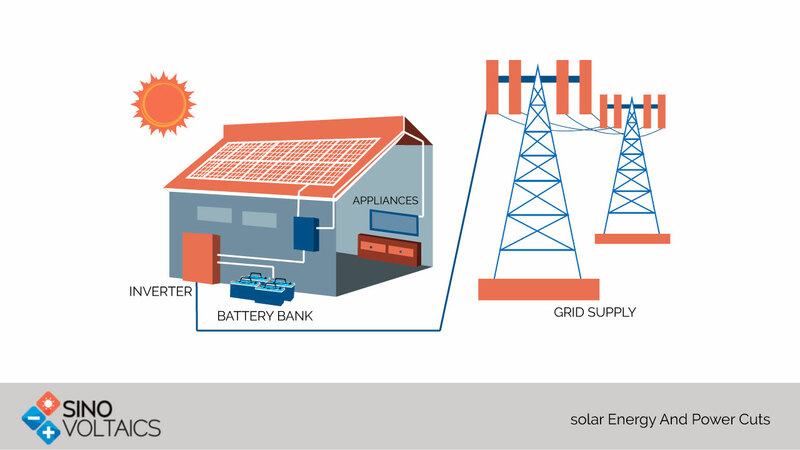 When solar power is less or non-existent, the inverter connects the load to the grid. In this case inverter has arrangements to charge the battery either from the grid or the solar panel. The inverter draws from the battery and feeds the load and /or the grid according to the conditions prevailing. In case the grid fails, the effect on the load is different in each case. Stand-alone or off-grid– No connection, no effect. Grid tied- Safety regulations demand that the inverter disconnect from the grid as soon as the grid fails. This is to ensure the safety of workmen who may be trying to repair the grid supply. Most inverters will shut down and cut out the local load also. As an exception some designs do have arrangements for feeding some essential loads from a bypass outlet provided solar energy is available. Grid tied with battery backup– This is the best arrangement although costly. While the inverter is cutoff from the mains, it continues to supply the local load until the battery exhausts. The switching arrangements are normally incorporated in the inverter, and hence, one can choose the inverter according to the type of installation desired.